Takeaway: Let yoga be your medicine and try these yogic techniques for mental wellness. As a mental health professional-turned-yoga teacher and someone who has also experienced the benefits of mental health services, I believe yoga is the most valuable tool in my mental wellness toolbox. Not surprisingly, the American Psychological Association also agrees that yoga is an important tool in psychotherapy practice. Many of us experience very similar mental health difficulties that often manifest as over-identifying with what has happened to us in the past (depression) and/or the fears we have about the future (anxiety). These are today’s two most commonly diagnosed mood disorders. However, I have witnessed in myself and others how intentional pranayama, asana and mantra practices help support mental wellness. Here are three yogic practices that can be used to help heal the depressed and anxious mind, and how to include them in your sadhana. Controlling the breath, or life force, is called pranayama and it is an essential yoga practice that bridges mind and body relaxation. Bringing our awareness to our breath allows us to create an easy focus during meditation. Deep intentional breathing also helps to improve the body’s functions by triggering relaxation and increasing its oxygen supply. A simple technique to control the breath that is taught as a mindfulness tool in therapy is just bringing our awareness to three consecutive deep breaths. This quick tool can be used to harness life force energy when symptoms of anxiety are present in order to ground ourselves in the present moment. It enables us to slow down or distract ourselves from thoughts that do not serve us. Many pranayama practices positively impact mental health. For example, anuloma viloma, an alternate nostril breathing technique, is said to relieve stress and anxiety. It relieves tension and brings balance by purifying the energy channels, or nadis, through each nostril. It is practiced in a comfortable meditative seated position with the right hand forming a Vishnu mudra, using the thumb to block your right nostril and the pinky and index finger to block your left nostril. The ratio is four counts of inhalation, 16 counts retaining the breath and eight counts of exhalation. This is difficult to do at first, so you can begin with 4-4-4 pattern instead while learning the technique. Anuloma viloma and other pranayamas challenge our mind to remain so completely present with the breath that it is a conscious decision to inhale or exhale. We can then become the silent witness of our own thoughts. Yoga allows a person to physically relax. It is this physiological response that researchers believe to be most responsible for health improvements. Relaxing positively impacts chemical imbalances that often coincide with mental health issues. On a neurological and muscular level, asana actually alters the way our bodies arouse to the threats we perceive. It can reduce the firing rate in certain nerve pathways by slowing the release of nerve chemicals, like adrenaline, leading us into a biochemical state of relaxation. Our bodies can return chemicals to their proper balance and, ultimately, heal. My favorite asanas for mental health are poses that invite the heart to open, inversions and balancing postures. Here are a few such poses you can start with. Heart-opening postures like fish pose are essential to bringing awareness and relaxation to the chest, shoulders and neck. This is a common area to store tension if experiencing anxiety. It also stimulates the anahata (heart) chakra, which cultivates compassion, self-respect and balance. 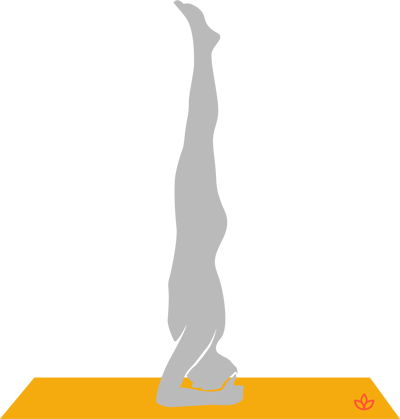 This advanced posture is an inversion and balancing posture. Through this asana, we find mastery in conquering fear through strength and control. Physically balancing our bodies brings stillness, while the inversion rushes freshly oxygenated blood to the brain. The Sivananda yoga lineage of Hatha yoga teaches tensing and relaxing our body parts in preparation for savasana. This increases the sensation of relaxation and alerts us to hidden areas of tension by using the contrast between forceful tension and relaxation. To try this practice, you can start with the feet and hands, raising and tensing those body parts during an inhalation, then dropping and releasing them during exhalation. Work your way throughout the body until it has been released in its entirety into a final relaxed savasana. Mantras are a powerful tool to ground ourselves in the present moment and free ourselves from our minds. In fact, from Sanskrit, man translates to “mind” and tra to “free from.” Because mantras are chanted in Sanskrit, they produce a particular powerful vibrational sound. Unlike English, the sounds produced are more important than the meanings. Through repetition of these vibrations, our samskaras change, we release traumas and let go of beliefs as they slowly penetrate even the deepest parts of our unconscious minds. Mantras actually change the energetic and neural network of the mind and help impede unhelpful thought patterns. Through repetitive chanting, sacred ancient vibrations alter samskaras and heal the mind. Chanting a mantra for an extended period of time allows for dharana. A single focus prompts the mind to become quiet. Your concentration becomes fixed on a mantra and its particular vibration instead of other thoughts that ruminate around in your mind. In my experience, this brings great relief to the symptoms of anxiety and depression. When choosing a mantra, base your decision on which mantras capture your attention and resonate within your body based on their sound, rather than their meaning. You may want to start with my favorites for mental wellness, such as the simple So’ham mantra, or one that is a little more complex, such as Om Gam Ganapatayae Namah. My yoga teacher says that “If you’re not meditating, then you’re a mess.” Mental wellness depends on a healthy, relaxed body and mind. Bringing awareness to the present moment, through pranayama, asana, mantra or meditation, too, is a path to relaxing the mind into a healthy state of consciousness.